The events of the last few weeks in Istanbul, with the possible murder of Jamal Khashoggi in the Saudi embassy, has put a spotlight on the western government’s attitude to human rights and the rule of law. For several years now we have been happy to sell arms to Saudi and we have been largely quiescent during the bombing of Yemen. Yemen has been in the news recently with filmed reports of the increasingly desperate state the country and its people are in. Reports of bombing of civilian targets and medical facilities receive brief coverage but do not however, generate much outrage. The scale of misery there is now huge and represents a major tragedy. The Saudi forces, aided by UK arms and military personnel, have wreaked terrible harm on the country. A whole list of non-military targets has been bombed including ports, food production facilities and refugee camps. As many as 13 million people are now suffering there. Yet our politicians are largely silent and the ruler, Mohammed bin Salman, is feted here by the Royal family and others. By contrast, the possible killing of this journalist has plunged the Saudi kingdom into crisis and led to many politicians withdrawing from the forthcoming Davos in the Desert. Much of our media seemed happy to accept the idea that MbS, as he is known, was a moderniser and were excited when he allowed women to drive for the first time. They overlooked the locking up of journalists, lawyers and human rights workers and did not notice that the woman who campaigned for the right for women to drive was in prison. It was as though a hint of reform was enough to switch off any critical assessment of his actual performance as a despot. Executions continue at an alarming rate and Human Rights Watch noted a spate of 48 in a four month period earlier in the year, mostly for non-violent offences. Torture is still routine. All this shows that the real concern is the sale of weapons and the supply of oil. It is fair to argue that MbS knew our politicians were more concerned about trade than they were about human rights or international justice. This is likely to have led him to believe he could remove the irritant of someone like Khashoggi and after a brief fuss, life would carry on. He may well be right. At present, we cannot know how this crisis will pan out for the Saudi government. Western governments are going through contortions trying to balance the need to keep in with the regime to protect commercial interests, with some kind of need to show a moral standing in the face of credible reports that Khashoggi may have been murdered and dismembered in the embassy. Liam Fox waited two weeks until today (18 October) to cancel his visit to the Future Investment Initiative. Amnesty is calling for an investigation. Any MP tempted by a lavish trip to Saudi Arabia ought to bear in mind that jailed Saudi human rights defenders are currently languishing in jail, while the Saudi coalition’s lethal bombing of Yemen is making lives miserable for thousands of poor and malnourished Yemenis. Saudi Arabia’s appalling human rights record is well-documented, and no parliamentarian should go to the country without being prepared to publicly raise human rights. The naiveté of the MPs is astonishing and some of their comments are quite disgraceful in view of the appalling human rights record of the country. It is unlikely that they will be pushing the government to adopt a more vigorous line in future. However, it has put our relationship with an unsavoury regime in the spotlight and with papers like the Mail giving space to the story, there are slender grounds for optimism. In our next blog, we shall be listing forthcoming events. If you live in the Salisbury, Amesbury or Downton area and are interested in joining, please have a look and come along and make yourself known. It is free to join our group. Minutes of the March meeting are attached thanks to group member Lesley for preparing them. The usual items plus a discussion on the major event we are planning in June. On 6 June 2017, our friend and colleague Taner Kılıç, a human rights lawyer and the Chair of Amnesty Turkey, was arrested. He has been in prison ever since. Taner is currently on trial, charged with “membership of an armed terrorist organization”. If found guilty he faces up to 15 years in jail. He has done nothing wrong. Taner is not a terrorist, Taner is a human rights defender and lawyer. Taner was one of the first lawyers in Turkey to advocate for the rights of refugees and has spent his working life trying to better the situation of refugees who have fled to Turkey. 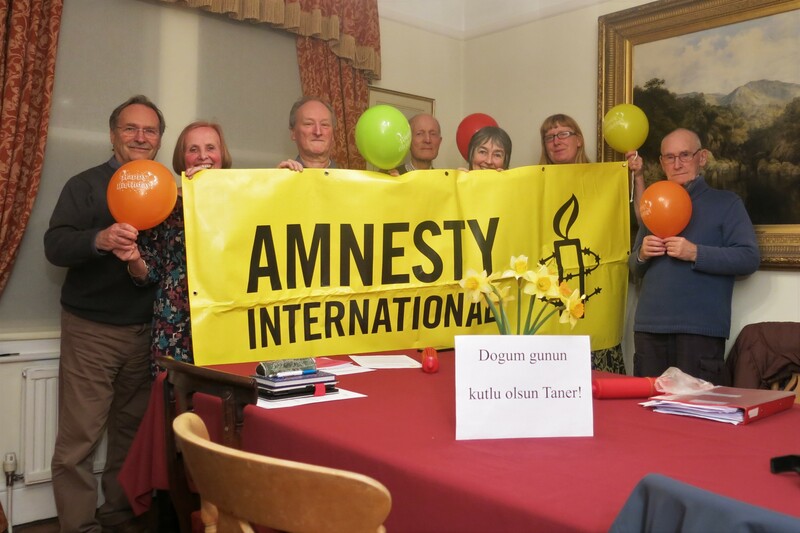 Members of the Salisbury group of Amnesty send birthday greetings to Taner. Attached is the Death Penalty report for April – May prepared by group member Lesley. It contains an update on the rush to execute people in Arkansas USA because of the imminent expiry of the drugs used. There is also an update on the situation with Reggie Clemons.